Notice: when opening TradeLog you may be prompted to update your software. Please do not update until after completing the verification below. You will reach an instruction to update your software as you proceed through these steps. It is essential that TradeLog users run the End Tax Year function when completing tax reporting. This function will create the next tax year data file and carry over all open positions, January trades, and related wash sales. To confirm you ran the End Tax Year function correctly you need to confirm that you have a2012 TradeLog file on your computer. (If you have more than one broker account you should have a 2012 file for each individual broker account). The steps below will show you how to confirm if you have 2012 files. TradeLog data files are stored on your computer. By default, they should be located in your Documents folder, in a subfolder named TradeLog. If you save your files in a different location, you will need to check that location. 1.) 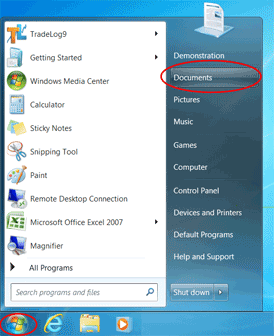 In Windows 7, go to the Start menu and click on Documents. 2.) In the Documents library, double-click on the tradelog folder. 3.) In the tradelog folder, look for a 2012 TradeLog file for each brokerage account you have. The filename will start with the tax year and contain the unique name(s) you created when you setup your file(s). Do you have 2012 data files for each broker account?